I remember when we had little kids, we just didn’t have nice stuff. What was the point, right? Everything was going to be covered in jelly and thrown around without discrimination. But now, our youngest child, Kyle, is 27 and he hardly ever throws his toys in the house anymore. These days, we sorta don’t have a child-proof house. In fact, we have cans of paint everywhere, and everything toxic from under the sinks is actually out in boxes at child-height. What little we can control in the pandemonium of home remodeling is actually kinda nice stuff. Glass tables, delicate wood carvings my father made, and of course our electronics. 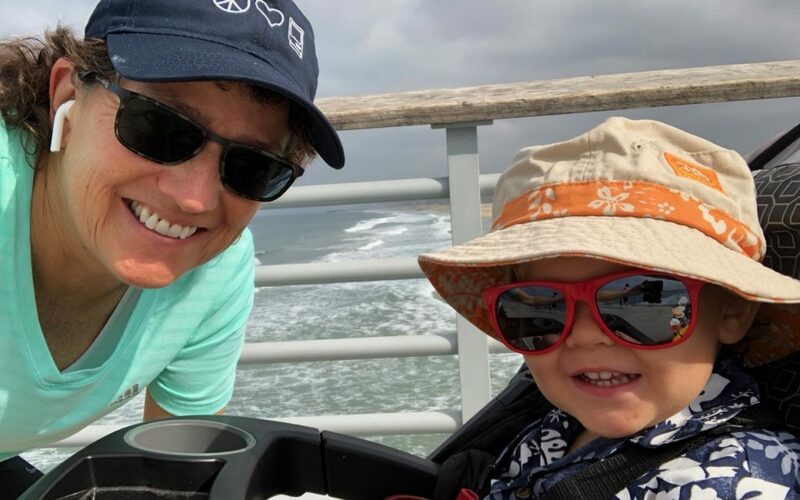 So when our grandson Forbes came to visit, I had to make a tough decision, and that was whether to let his little banana-smeared fingers touch my iPad. Of course, the little man who has stolen my heart got to play with the iPad. While sitting on my lap. On my bed. In the middle of the bed. 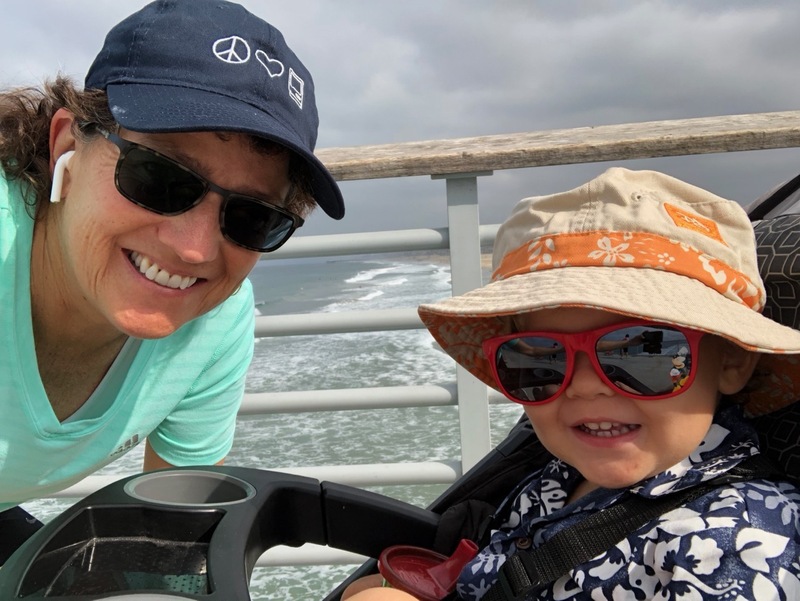 I let him play with three apps I thought might be fun for you to have in your back pocket in case you ever have to entertain a little monster yourself. 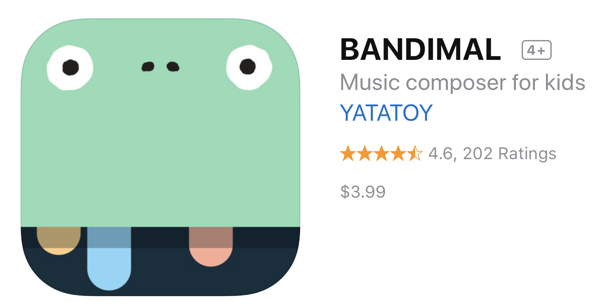 The first is BANDIMAL (all caps) from Yatatoy for $3.99 in the App Store. The idea of BANDIMAL is for your little angel to make music on an iPad while being entertained with funny animations. The interface on BANDIMAL is unique. You get three animals, each of which makes a different noise. 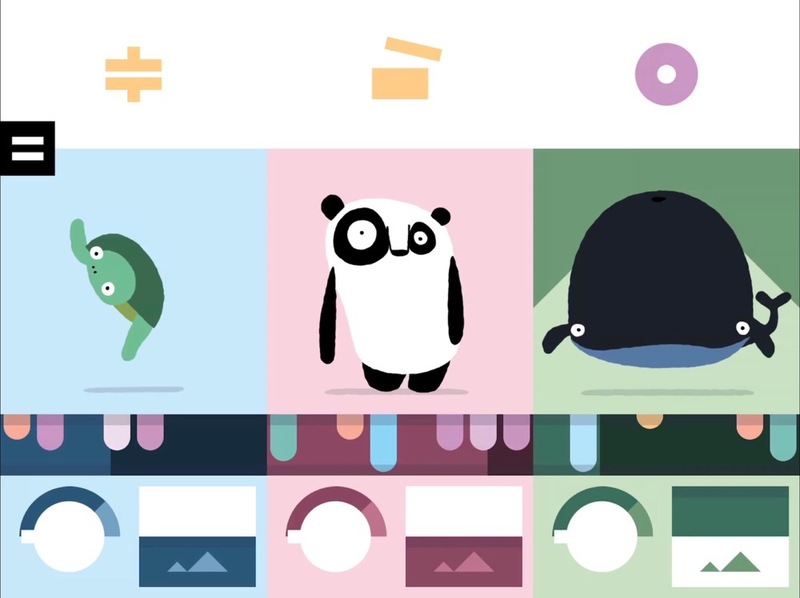 Below the three animals is a timeline moving across over and over again. In the timeline area are 8 vertical columns of 5 dots. If you tap and drag your finger down one of the columns of dots, that triggers the selected animal to honk or tweet or blat a noise. The farther down the column of dots you pull, the lower the pitch of the honk or tweet or blat. When the timeline hits one of your columns of dots, the honk or tweet or blat occurs while the animal selected goes through a very silly animation. I’m partial to the panda bear, whose face distorts when it makes the noise. My favorite distortion is when there are 3 dots because just one eye bugs out. Above the animals are three percussion instruments. Tapping on these changes what they do and can toggle each of them off. Between the three animals making all these silly noises, on a beat of 8, and the percussion joining in, you’ll have a delightful cacophony of sound before too long. In case the little one bores of making the lines to make the music change, they can drag across on each animal to change it into a new animal. I didn’t explore them all, but there’s flipping turtle (and that’s not a euphemism for swearing, he really flips), a honking rooster, a wiggly snake, and a whale that blats in a way that makes me giggle every time! Along the bottom are two controls: one I can tell changes the background of the selected animal from day to night, but the other one baffles me. It appears to cause the animal to pause for maybe one beat and then move forward again, perhaps to get it to be in the rhythm of the other ones? Maybe I’m not smart enough to play this game! For a 2-year-old I think it was a little more complex than he could grasp. He liked the sounds and enjoyed the animations, but I think as he gets a little older he’ll appreciate that he is changing the pitch of the sounds when he drags the lines. As it was, he just seemed to like moving things around but didn’t seem to make the connection between those actions and the results on screen. I think BANDIMAL would be better suited for 4-to-6-year-olds if I’m correct about their capabilities. Oddly BANDIMAL isn’t accessible, and I can’t think of a reason why not. Seems like an obvious miss to me. Maybe the visually impaired couldn’t see the animations but the music is the fun part! 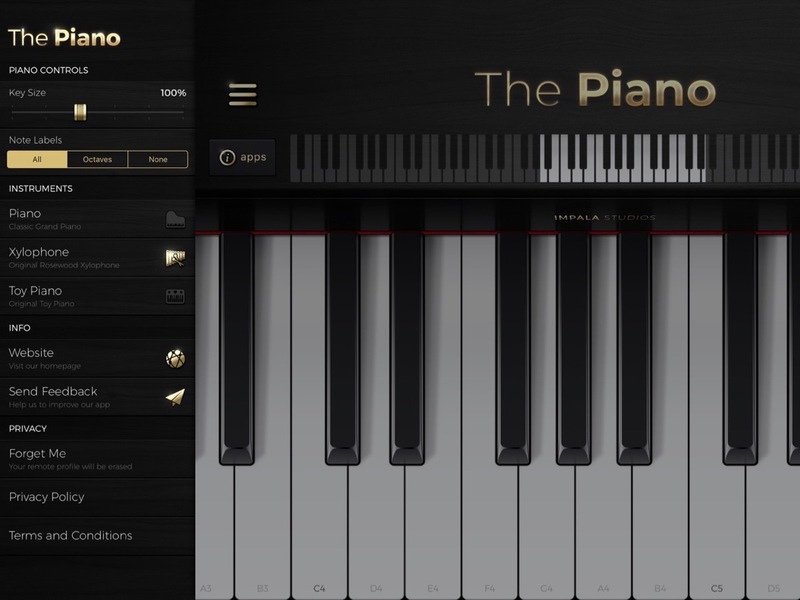 The next app Forbes and I tested for you is called The Piano from Impala Studios. I started with The Piano Free (and later bought the pro version to remove ads, but more about that later.). Oddly the free version has a period at the end of the name, so it’s “The Piano.” when you search for it on your iPad. The Piano is a great way to engage a child, but I had a lot of fun with it too. The Piano opens with a nice piano keyboard which looked pretty close to the size of standard piano keys. I got curious about whether they were actually the right size. Pat Dengler makes fun of me for digging deep on every subject, but I can’t help myself. After a bit of research, I found a Wikipedia article about pianos, which said the standard white piano keys are 23.5 mm wide. On my 12.9″ iPad Pro the keys are 18.5 mm wide, so they’re around 78% of full size. Then I got curious whether they were a different size on the 9.7″ iPad Pro. On the 9.7 they’re even narrower, at 17 mm or 72% of full width. I’m sure glad we got that settled. There’s a hamburger menu on the left that reveals some really fun stuff. The very first thing I noticed was a slider at the top for key size! You might be thinking we did all that measuring for nothing, but now we get to do math with it! The slider is a percentage, so if we want 23.5 mm wide keys, and 100% on a 12.9″ iPad Pro is 18.5 mm, how fast are the two trains going? Wait, that’s not it. 23.5/18.5 = 127%. Sadly The Piano’s slider only goes every 10% so I had to settle for 130%, but that was within my margin of error – it looks around 23 mm. I feel better now. The speakers on iPads are fantastic now, so The Piano actually sounds great even when Forbes is playing it. Across the top above the keys, you can see which keys are showing of the full set of 88 keys. You can scroll across to change which set of keys you’re playing which is cool. Fun for the kiddies to hear the different pitches. Ok, fun for me too. There’s more fun under that hamburger menu. You can turn on note labels, so if you’re learning the piano, you can see the notes (A-G) or the notes and the octave number. The black keys don’t get any labels though so good luck figuring out that C# and B♭are the same darn key! Ok, by now someone is asking themselves, “If Allison doesn’t like music, why does she know something like that?” Well, I’ll have you know that I played piano for years. Of course, my mother told me that when my brother quit his lessons she cried, but when I quit she sighed with relief! She said that I positively attacked the piano. With that mystery solved, let’s just move along. Back in the hamburger menu, you can change the instrument from a classic grand piano, to a xylophone or to a toy piano! I love the toy piano the best because it reminds me of the severely out-of-tune piano my mom had at our cottage on the lake when I was a young child. I also remember when Lindsay was a toddler and she was just not getting the concept of the mouse with our Mac IIc. We got her a program to play the piano and she started flailing the mouse around on screen. When it hit one of the keys and a sound came out, it was like she’d been struck by lightning. She froze in place and then cautiously moved the mouse over and a different tone came out. She was instantly hooked, and that hand-computer coordination translated to all of the other kids apps we had gotten her. Plus, music, am I right? I hope you’re impressed with our musical prowess. Under the hamburger menu, there’s a very prominent button that says “Forget Me”. Below the button it says, “Your remote profile will be erased.” Not sure what private information they would have collected, but don’t you wish a lot of applications and services had a simple button like that? I hope you’ll unlock some musical talent in your young ones with The Piano, and fill your house with music, of a sort. Like it did with Steve. The app that entertained 2-year-old Forbes the longest though was the drawing app for iPad called Procreate. I’m not going to do a full review of Procreate because its praises have been sung far and wide ever since it came out. Procreate is $10 for iPad from procreate.art/…. In the context of entertaining our tiny little guy, I can tell you it got squeals of joy. With Procreate, he could easily draw and paint on screen with his finger. As soon as he grew a tiny bit bored, I could change the color of his finger. I say it that way because after he painted on the screen the first time, he turned his finger around and looked very carefully at it, as though trying to discern why blue just came out of it! When color change excitement wore off, I started changing the style of brush with which he was painting. He loved the different brushes. They’re not just thick and thin and paint sprays, there are all sorts of unique shapes to be used. The smudge brush was actually one of his favorites, which simply smeared what he’d already drawn. As much as he enjoyed Procreate, I think it would be even better for older kids. His dexterity at choosing brushes and colors isn’t quite there yet, and he definitely didn’t grok the concept of changing brush sizes. It’s a good investment at $10 because it will continue to entertain him as he gets better at these things. 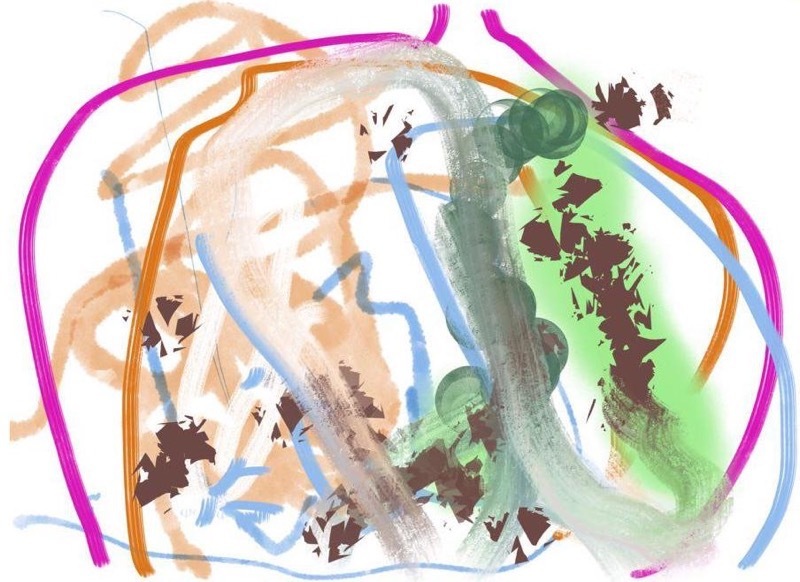 I know people love Procreate for creating truly beautiful art, but the drawing Forbes made for me is just as precious. The bottom line is that these three apps kept a two-year-old busy for nearly 20 minutes. And it was 20 minutes where I had to make sure the iPad was safe. But it was 20 minutes where he was creative and happy not just watching a video or something like that.